Safe Harbor Animal Hospital is aware of the vast amount of information available on the internet. Because some of the information available online can be misleading at best and dangerous at worst, we have put together the following links to websites that provide reliable resources for all of your pet's needs. If you can't find what you're looking for, please don't hesitate to contact us. We enjoy talking with concerned pet parents! 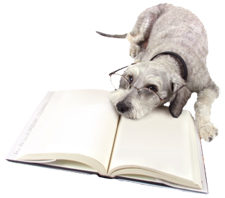 Click here: www.veterinarypartner.com to access the Pet Health Care Library (a searchable database powered by the Veterinary Information Network). You may also scroll down this page to view Links to our favorite, trustworthy websites. We would love to hear your ideas on links that you would like to see us add to this page to share with other pet owners. Feel free to send us your favorites. If we like them, we will add them to our list! Ask Dr Yin Leadership without force. You don't need to be dominant! Animal Behavior Resource Institute To enhance human animal relationships and improve quality of life for people and animals by providing education and animal behavior resources. Clicker Training Clicker training is an animal training method based on behavioral psychology that relies on marking desirable behavior and rewarding it. Dogscouts.org Loads of great training advice and videos. Behavior problems Terrific resource for advice on a variety of behavioral problems. If you want to learn more about feline housesoiling, barking dogs, aggression, or any other behavioral problem, check this one out! Pet Fit Optimize your pet's weight with the right nutrition and transform the special bond you both share. Association of Pet Loss and Bereavement You will find inspirational stories, grief counseling resources, a hotline number and many other resources. American Society for the Prevention of Cruelty to Animals Working toward the day when no animal will live in pain or fear. Know Your Breed The online magazine for all pet and showdog owners. Dogs and Puppies at DogChannel.com - Get the latest dog news, puppy training tips and articles from the editors of DOG FANCY magazine. Take dog polls and quizzes, send puppy e-cards and make your dog's own web page. Cats and Kittens at catchannel.com - Get the latest cat news, kitten raising tips, and articles from the editors of CAT FANCY magazine. See cat breed profiles, the cat photo gallery and get cat adoption information. Take cat polls and quizzes, send cat e-cards and make your cat's own webpage.